A heart, comforting pork chop dish that will liven any winter night, this meat dish takes only minutes to prepare. Pork chops are browned, and simmered in a gravy of tender mushrooms and onions, zesty cumin, and creamy chicken broth. Topped with parsley for an added burst of flavor, this simple recipe will be an instant hit. Serve with a spinach salad and glass of white wine for a memorable meal. Season pork chops with salt and pepper. In large skillet heat 1 Tbsp olive oil over medium heat. Brown pork chops in oil, about 4-5 minutes per side. Remove from skillet, and set aside. Add remaining olive oil to the skillet, and add onions and mushrooms. Saute until slightly golden, about 5 minutes. Stir in flour and cumin, and cook until lightly golden in color. Slowly stir in chicken broth and mustard, and bring to a boil. Reduce heat to a simmer, add parsley, and return pork chops to skillet. Season with salt and pepper, and simmer 5 minutes, or until pork chops are cooked through. Made this last night and it was great. The sauce/gravy was delicious. I did add two cloves of minced garlic, but otherwise it was the exact recipe. Wasn't sure if I would like the Dijon but you couldn't taste it. It just added another layer of flavor. It's a keeper. Made this tonight, it was awesome! So good and super easy to make. A must for a cold winter night. Loved this... it was amazing. Average rating of 5.00 stars based on 3 reviews. Summary: A heart, comforting pork chop dish that will liven any winter night, this meat dish takes only minutes to prepare. 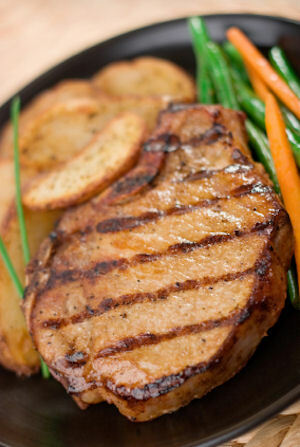 Pork chops are browned, and simmered in a gravy of tender mushrooms and onions, zesty cumin, and creamy chicken broth. Topped with parsley for an added burst of flavor, this simple recipe will be an instant hit. Serve with a spinach salad and glass of white wine for a memorable meal.